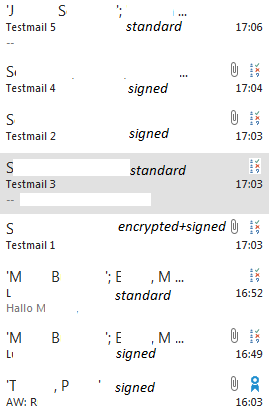 As you can see in my screenshot (made anonymous and commented in Paint), OL2013 often assigns a "Terminabsprache"-Icon to my sent mails, which have nothing to do with Terminabsprachen. I think it might be a consequence of GPG4win / GPGol. Perhaps it happens because I'm asking for "Lesebestätigungen" along all mails? But still the icons for signing should not be gone!